Last week I spent a day at Southbury Elementary School in Illinois. (Hello Southbury!) They had students for half a day and the afternoon was a time for us to come together for professional development. In the morning, though, with students, I modeled writing workshop in a fourth grade classroom and a second grade classroom. Modeling writing workshop in other teachers’ classrooms is a significant part of my day to day life. I’m constantly in other teachers’ classrooms learning alongside them about teaching writers. Sometimes when something becomes part of your daily grind, you forget how remarkable it really is. I know it takes a brave spirit to invite another person into your classroom. When I say “I know” it’s not in the sense of I can imagine, but rather I know because I have firsthand experiences. I invited a coach into my classroom thirteen years ago. It was the first year we had access to an instructional coach, and before I even knew what an instructional coach was. Looking back, I could have made it easier for her. I wondered what she was going to do in my classroom. I wondered what she was going to think of me. I was nervous. I asked a ton of questions. I watched her every move. I wrote down things I noticed. I talked her ear off. I listened some. I don’t really remember much of what she did in the classroom, but I remembered how she made me feel. She made me feel like I was capable. She made me feel like writing workshop was possible in my corner of the world. She pushed me to learn more about teaching writers, and she nudged me along a path of growth. The following year I opened my classroom again. This time I was even more nervous. Carl Anderson was going to model in my classroom. Gulp. I remember making sure everything was perfect. I talked to my students about Carl, showed them his book, and also explained thirty other teachers would be watching too. More importantly, I shared with students the reason this was happening — so I could grow as a teacher. 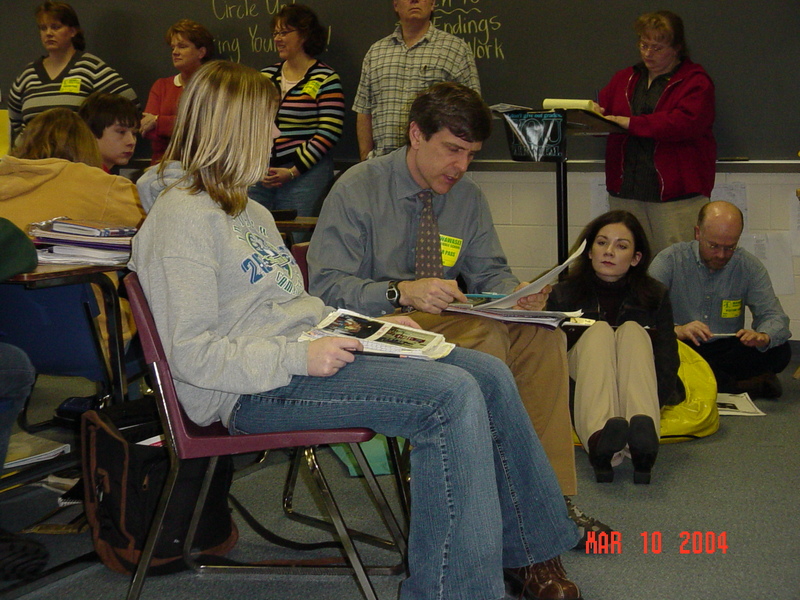 In 2004, Carl Anderson modeled writing workshop in my classroom. Here is he conferring with a student, and there I am watching and learning. Because of these experiences, I’m always honored to be invited into a teacher’s classroom. I also cling to the fact that these experiences shaped me as a teacher of writers more than any other professional development. Seeing writing workshop in action in my classroom (and other classrooms) has been the very best professional development of my career. In addition to watching and learning from colleagues, I’ve observed Carl in many other classrooms, as well as Ellin Keene and Penny Kittle model workshop. Whenever I consider professional development opportunities, I consider observation first. Next week Deb Gaby (the reading coach in my district) and I are taking two middle school teachers to observe Christy Rush-Levine so they can see the work in action. Deb and I were considering professional development for ourselves and our first thought was to see if we could observe Patrick Allen in his reading workshop. The heart of the work lies within classroom walls. Whenever we can see writing workshop in action, we learn. I’m thankful for the reminder of the power of modeling. I’m thankful to remember the powerful opportunities before me each day when I get to work alongside teachers in their classrooms. And I’m grateful for schools like Southbury Elementary who learn alongside one another as colleagues and have invited me along for a bit of their journey this school year. I feel like I’m part of a bigger circle — getting from others and now giving back. At the end of the day, several teachers told me they feel inspired and empowered. Is there any better compliment? I teach only Writing, to grades 6, 7 & 8 (our school has writing as an afternoon class, in addition to English/LA in the morning). It’s my 3rd year and, for a full week, in the month before I first taught, our school brought in a writing coach who modeled workshop, and had us practice both as teacher and student. Looking back – and watching others who have stepped into the same class without that week’s introduction – I can’t imagine having taught it without the generosity of that learning experience. To me, teaching writing is like teaching math: being good at doing it yourself does not mean you understand the techniques and approaches that help you teach someone else to do it. By modeling how to make lessons concrete, anticipate ability levels, conference, etc, that teaching coach gave me a start in the right direction. She returns to our school once a year or so, and I look forward to her visits. I know it can be intimidating to have another teacher watching, but the feedback is so useful — and it’s great to have someone who is interested in hearing about the lessons or approaches I’ve been excited about. Southbury is a lucky school! I have to agree that observations are a powerful professional development tool. Whether observing, or being observed, they surely prompt reflection and growth. I am looking forward to your visit this week! I hope the experience turns out to be as valuable as it has the potential to be. I know what you mean about being brave… I am trying to be as brave as possible while I freak out inside about revealing the truth about what really goes on inside my classroom walls. I have to quiet that critic in my head and listen to the cheerleader in my heart. It was such a rewarding experience for my staff to have Ruth come into our school last week. Thank you so much for sharing your wisdom and passion for writing with all of us. You not only reassured us that we are doing wonderful things for children, but you have also inspired us to try new things and push our students farther as writers. Thank you so much, Ruth! Can’t wait to see you again in February! Last week, as part of our Superintendent’s Conference Day, teachers in my small rural school district got to spend time thinking about Writing Workshop with Katie Wood Ray. She spent half the day with K-2 and the other half with 3-6. As the K-3 literacy coach I found the time with her was inspirational. With all the thinking required for assessments, student learning objectives, etc., it gave us a chance to think about the fact that our students are little people with voices that need to be heard. It helped us think about ways to help them do just that. So many teachers tell me that Writing Workshop is so challenging for them but time with Katie inspired them to just get started! Oh, how you have grown in your writing life in just a short time. Learn on. You gotta love Carl. I first met Carl in the spring of 2003 at the TC Reunion, which led me to How’s It Going? Assessing Writers, Strategic Writing Conferences and a lifelong love affair with the TCRWP, NYC, urban school reform and the Beatles. Carl taught me how to confer, his books gave me a window into his thinking and helped me find my own voice as a teacher of writing. When I read your post, it amazes me that he did this for so many people. It is so important that what we (as coaches, lead teachers, teachers, and staff developers) never forget is that “inspiration” is THE essential ingredient. What I think gives people agency and motivates them is inspiration. Carl inspired me by giving me an image of what was possible in writing workshop, and “connecting” with my students. My teaching and learning were changed forever. Do we give students, and teachers an image of what is possible and inspire them to reach new heights? You gotta love Carl. I first met Carl in the spring of 2003 at the TC Reunion, which led me to How’s It Going? Assessing Writers, Strategic Writing Conferences and a lifelong love affair with the TCRWP, NYC, urban school reform and the Beatles. Carl taught me how to confer, his books gave me a window into his thinking and helped me find my own voice as a teacher of writing. When I read your post, it amazes me that he did this for so many people. It is so important that we (as coaches, lead teachers, teachers, and staff developers) never forget is that “inspiration” is THE essential ingredient. What I think gives people agency and makes motivates them is inspiration. Carl inspired me by giving me an image of what was possible in writing workshop, and “connecting” with my students. My teaching and learning were changed forever. Do we give students, and teachers an image of what is possible and inspire them to reach new heights? I’d love to come watch, too, Ruth. What an opportunity for you all. It is a pleasure when I get to be in someone’s classroom, teaching beside them & watching them too. What an affirming post for what you do so well! Can’t wait to hear about your experience! Dear Ruth, Oh, how I wish we lived closer to each other. You are a beautiful spirit…. a. Thank you for this post. I truly believe that writing and reading workshkops are important venues for our students to learn to be writers and readers (no matter where life ends up taking them). Every time I have watched another teacher facilitate a workshop, I have learned something valuable. I wish my district still allowed this kind of professional development. Your blog gave me new incentive to fight for this again. Thanks. I love, love, love this post. It is affirming to me in my belief in the workshop model and it is inspiring to me as a first year coach. I need to remember how much bravery and trust it takes to let people into classrooms and how my goal really needs to be making teachers feel capable–you said this so simply but so wisely. I am printing this post and keeping it on my bulletin board so that I can refer to this post and remember the power of modeling and the importance of trust. Like Tammy and Deb, I am envious – but I know that you will share what you learn, Ruth, so that makes me feel better! I want to come—can you hear the whine in my voice. Sounds like a great PD opportunity for your teachers. I can’t wait to hear how things go! I’m so jealous. I teach first grade but I would LOVE to observe in Christy’s class, or have one of you or Carl come and teach in mine. Ahhh the troubles of a small rural town. I will be anxious to hear the follow up. I learn so much from all of you. Ruth, I was one of those inspired and empowered Southbury teachers. Thank you for providing me with more insight about writer’s workshop. You have helped me to feel that I am capable of reaching my student writers in a personal, meaningful way. It was a fantastic opportunity to observe you “in action” as you worked beside the 4th graders, teaching them writing skills in a way that they will remember and keep in their writing toolboxes forever. I look forward to your return to Southbury! Once an instructional coach comes into your classroom and starts teaching, the nerves are completely gone. Not only did I learn so much more about Writer’s Workshop, but so did my students. I felt so inspired, empowered, and excited about the new things I learned about Writer’s Workshop. I couldn’t wait to see my students and talk about the lesson and what they learned. The amazing and exciting thing was that so were my students! We talked yesterday about characters talking, moving, and thinking and how great it was to have you in our classroom. They talked about how much they learned and I talked about how much I learned. Just like you said we need to model how we write and write in front of our students, I think it is just as important to show how even teachers are constantly learning. I think you made my whole class and I feel capable in writing. You empowered and inspired all of us and I thank you so much for that!